Lori Allen, who runs a successful bridal shop featured in the reality show Bridals By Lori, got a 7:05 a.m. telephone call in April that changed her life -- she had breast cancer. One of those women, DeLese Range, has battled cancer in 23 of her 25-year marriage. She and husband Lonzie, who live in Carollton, Texas, will renew their vows next June in a dress provided by Allen. "When I first got married, I borrowed my brother's girlfriend's dress and wore it at 2 o'clock -- she wore it that night to the prom," said Range, 43, who's survived ovarian and breast cancer survivor and is now being treated for lung and lymph node cancers. Allen's journey with breast cancer, "Say Yes to the Cure: Lori's Fight," premieres tonight at 10 p.m. on TLC. The special, which features Range, airs as part of National Breast Cancer Awareness Month. An estimated one in eight women will develop breast cancer during her lifetime, according to the American Cancer Society. It is the most common cancer among American women, except for skin cancers. About 39,510 women will die from the breast cancer this year. "It turned my world upside down," Allen told ABCNews.com. She was so terrified by her breast cancer diagnosis, "I couldn't say the word for five days." But she approached TLC, which produces her show, and offered to tell her personal story. Three days after the doctor's call, TV crews began filming. Allen was looking for a woman who had survived breast cancer to help her make wedding dreams come true. She found Range through the Susan G. Komen For the Cure Foundation, and the special follows Range's search for the perfect dress. In 1989, just two years after her makeshift wedding and pregnant with her second child, Range was diagnosed with ovarian cancer. She recovered after chemotherapy and radiation, but in 2001, Range found out she had stage-four breast cancer. "We had a nurse seven days a week and had to put a hospital bed in the bedroom next to my husband," she said. After aggressive treatment, Range was prepped for a mastectomy. "We were in the hospital and the doctor came in and sat us down. He said, 'I don't think we have to do it now.'" X-rays revealed that she had gone into a complete remission without treatment. Medical experts were baffled, but Range was overjoyed. "They can't explain it," she said. But a decade later, in 2011, Range would face yet another cancer diagnosis. This time it was lung cancer, even though she had never smoked. And then, another blow -- doctors found unrelated cancer in her lymph nodes and she is now back on chemotherapy. Range and Lonzie had hoped to renew their marriage vows this year, marking their 25th anniversary with their children at their side, but cancer stood in the way. "When the chemo came up, we couldn't do it financially," she said. "It was going to have to wait." 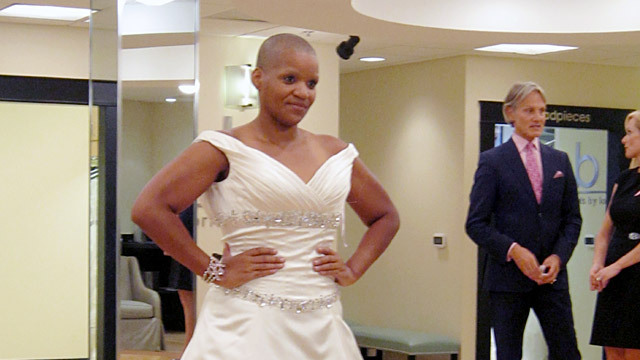 But when Bridal's By Lori sought a breast cancer survivor for its TLC special, Range's husband, 45, who is a minister and also works for the U.S. Postal Service, responded. He wrote a letter to the Komen foundation explaining their story. Allen had been there herself. "My whole family rallied around me," she said. "They were just as shocked as I was over the diagnosis." Allen underwent a double mastectomy, but was spared further treatment. "Doctors don't grab you by the hand and say, 'Do this' -- I had to figure it out my own path," said Allen, whose prognosis is now bright. Helping others has "given me new meaning in my life," she said. "I have taken something that was really negative and turned it into a positive." As for Range, she has continued to be active with the Komen foundation and has recently endured three straight weeks of chemotherapy -- so she can take time off from treatment to participate in its upcoming 60-mile, three-day walk for breast cancer awareness. She hopes to get back to her work as a personal trainer soon. But as the mother of two adult children and three grandchildren, Range is determined to be there for her family and is hopeful about her future. "I am good, I am actually doing O.K.," she said. "I have my support system and it helps." They only have one big worry now -- who will officiate their vows ceremony, scheduled for June 2013? "My husband is a minister," she said. And so are her brother, father and father-in-law. "I am going to have a problem picking," said Range. "I was estranged from my dad until 2001 and found him again. It's between my father and my father-in-law. I don't know."